Irish genealogy resources: feature articles about individual archives, heritage centres, libraries, museums and lesser-known record collections. Find relevant collections and advice. Learn about archives in Ireland. Irish genealogy resources are well-known for being disjointed and incomplete and, for the large part, sprinkled across the island in a pretty haphazard fashion. 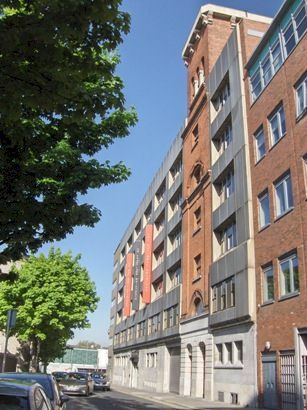 Jacobs Biscuits factory in Bishops Street, Dublin. What is more, the apparent scarcity of records (particularly the 19th-century censuses) stops many from ever embarking on their family history. Ironically, those that get over this first obstacle can soon be lulled into a false sense of how easy this genealogy malarky can be. Significant numbers of beginner family historians make free and relatively pain-free headway using the 1901 and 1911 Irish censuses, the birth, marriage and death indexes of the civil registration system, and big chunks of the land records set known as Griffiths Valuation. In making these early discoveries, they may have to pay for a few (or more) bmd certificates, but the leaps can be huge at this stage of research for relatively little outlay and time investment. Once out of the starting gate, however, Irish genealogy resources start becoming more difficult to access. Griffiths Valuation is a perfect example. While the Householder Index and maps are available online (both free and payable versions exist), some of the original valuers books (Tenure Books, for example) are at the National Archives of Ireland, others (Cancelled Books, for example) are at the Valuation Office on the other side of the Liffey, while still others (the Local Books) are held by local archives. Okay, thats not how it really is, but thats how it can seem to an amateur genealogist who has never ventured beyond the online list of an archive collection. The geographical spread of Irelands genealogy resources can be very confusing to the family historian, and particularly irksome to one who is on a short, personal-heritage visit to Ireland. But quite apart from the inconvenience, time and cost involved in having to traipse from one repository to another, there is also the 'fog' to be waded through. This section of Irish Genealogy Toolkit is intended to help you clear a path through the fog by coming at Irish genealogy resources from a slightly different direction. Instead of thinking there are no accessible records beyond the best-known, big 'starter' collections of census, bmds and Griffiths, these articles will 'take' you through the doors of repositories across the island to find out what they hold and which collections may be useful to your Irish genealogy research. I'll be visiting well-known institutions, county archives and libraries, local studies units, specialised museums and very localised heritage centers of all shapes and sizes. And in each case, I'll be interviewing the people who know their collections inside out, who know from experience what value their materials offer family history researchers, and getting tips and advice along the way. Gathering a useful collection of features about these Irish genealogy resources is going to take some time but I've started the process. Each article is, obviously, correct when it is written and first published here, but collections, access arrangements etc will change over time; while I will endeavour to keep details up to date, do be mindful of the date each feature was written and check for subsequent developments. Run by the County Council but part of the Irish Family History Foundation's network of family history centres, Wicklow Family History Centre is managed by acting archivist Catherine Wright. In this feature she gives helpful advice for researchers looking for ancestors in Wicklow. A little gem that anyone with family from this West Cork town ought to visit. Joanne Rothwell is the Archivist at Waterford County Archives based at Dungarvan. In this interview she clarifies the role of the Archivist and reveals details of the ongoing work to make more resources available. With its insight into the collections held in the storeroom, this feature is a must-read for those with ancestors from Waterford. What's new about the past? Because family history is about the past, it's all too easy to assume that Irish genealogy resources are somehow stuck in time and that nothing new ever emerges. To some extent this is true, after all, contemporary records were made, and they either exist or they do not. But, and it's a huge but... some of those contemporary records have survived and are simply not available to family historians. Some are stuck in filing cabinets or attics, their owners  whether individuals, corporate enterprises or state organisations  unaware 0;pof their research value or even, in many cases, their contents. Some owners might have an appreciation of their research potential but don't know who to approach to ensure their preservation. Then there are the collections already in the safekeeping of Ireland's understaffed archive network, that are waiting to be cleaned or conserved, and sorted, some day, some time, never. And there are plenty of collections that, while officially sorted and accessible to researchers through the larger institutions, haven't yet been indexed or presented in such a way that anyone other than the most die-hard academic researcher has the time or inclination to wade through. To all intents and purposes these records 'don't exist' as Irish genealogy resources. However, in time, these collections will become available, in digitised and indexed format. This process, which started in earnest with the 1901 and 1911 census, has transformed Irish ancestral research within a decade.